Things seem to be looking up at Uber’s embattled self-driving car unit. The company just made a deal with Volvo for as many as 24,000 XC90 sport utility vehicles to be delivered between 2019 and 2021. Uber then plans to add its own driverless technology and unleash a fleet of robo-taxis onto the world. It would be the first of its kind. News of the deal and Uber’s continued ambitions to lead the way on driverless cars comes with a lot of caveats. A small one is that retail prices for the XC90 start at $45,750, which means this deal could cost Uber around a billion dollars. Which is a lot of money for a company that famously loses money very quickly. The bigger problem is the company’s on-going lawsuit with Waymo, the self-driving car unit of Google’s parent company, Alphabet. Waymo has accused Uber of stealing confidential information about its self-driving technology when it acquired the self-driving truck company Otto and hired its star engineer Anthony Levandowski, who co-founded Google’s self-driving car operation. The trial takes place next month, and things do not look good for Uber. A recently revealed report shows that Levandowski started meeting with Uber six months before he left Google and then destroyed five hard drives that contained proprietary Google data after Uber told him not to bring any trade secrets from his old job. Uber fired Levandowski earlier this year, claiming that the 37-year-old engineer refused to participate in an internal company investigation. Uber’s CEO Travis Kalanick resigned a month later, after a string of scandals involving sexual harassment and discrimination. After all that fracas, Levandowski founded a religioncalled Way of the Future that focuses on “the realization, acceptance, and worship of a Godhead based on Artificial Intelligence.” Which is a weird thing to do. But the Waymo lawsuit is just the most immediate problem that Uber faces in attempting to be the first ride-hailing service with its own fleet of self-driving cars. In recent months, multiple reports catalog in-fighting and technological struggles within Uber’s self-driving car unit, known as the Advanced Technology Group (ATG). 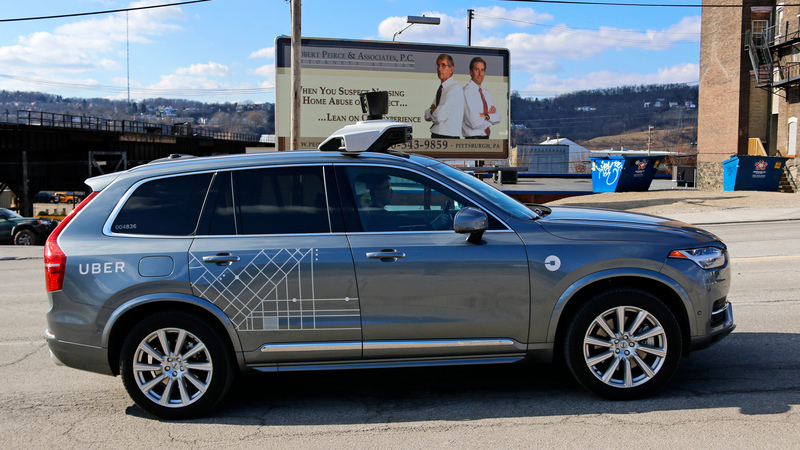 Uber made a big splash a year ago when it picked Pittsburgh as the headquarters for the ATG and poached several prominent professors from Carnegie Mellon University to develop its self-driving technology. It only took the company a year to chase away several of those engineers—some of whom started competing driverless car companies—and alienate the city of Pittsburgh by failing to produce jobs and support fundraising efforts, among other things. The city’s controller, Michael Lamb, called the Uber partnership “an opportunity missed” this past May. Still, Uber’s engineers in Pittsburgh march on. The team is slowly confronting the very difficult problem of perfecting self-driving technology and scaling it up to work on an entire fleet. Now that the company has actually signed an agreement for a fleet, the ATG is under pressure figure it all out in a few short years, not decades. That is, of course, assuming that Uber’s new CEO, Dara Khosrowshahi, can eventually steer the ship away from its scandalous, money-losing habits. And also assuming that the verdict in the Waymo lawsuit doesn’t lead to serious setbacks for Uber in the self-driving taxi race—a competition the company must win, some say, to keep having a future. So, uh, congratulations to Uber on buying all those Volvos. If the self-driving stuff doesn’t work out, at least the resale value tends to be pretty good with those Swedish safety machines.